"Living in a garden pavilion" is how the LA Times Home Magazine described this home in 1978. The existing 2,000 S.F. 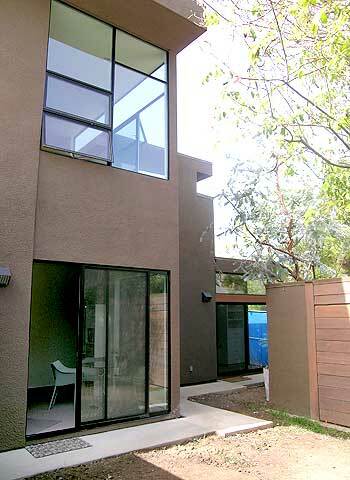 residence by architect Ellis Gelman created an innovative site plan that provided a courtyard on the site. The current owner needed more space to include an office atelier and guest grand parent suite. The new 1,000 S.F. two story addition fills in a portion of the courtyard and provides a vertical counterpoint to the horizontal existing residence. Large north facing wall of glass provide light for the second story home office and a protected south facing ribbon window provides views to the Santa Monica Bay.